Last week I delivered a presentation at the Conference Board of Canada’s Public Sector Social Media event in Ottawa where I deviated from my usual focus on overarching digital trends and strategy. I decided to provide an update to a practical deck I had developed a while back and add some new tools. 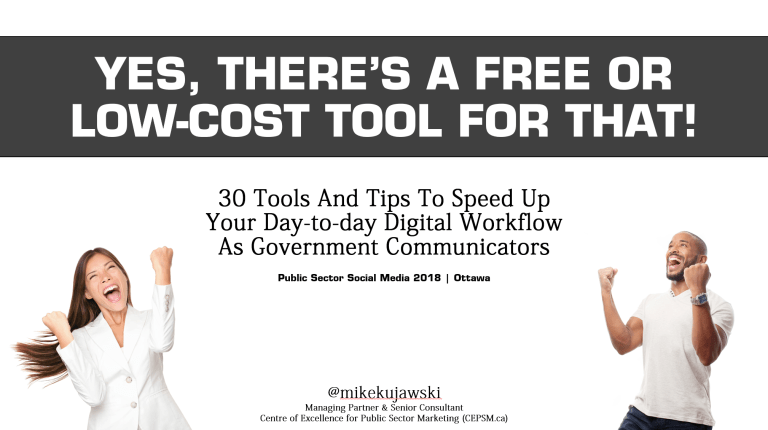 I called it 30 Tools and Tips to Speed Up Your Day-to-Day Digital Workflow as Government Communicators. Have you ever found yourself wasting a considerable amount of time performing some annoying, repetitive process within a common application, social media website, or your web browser? Wish there was a “magic” shortcut or simply a better way of getting it done? There most likely is. While having a solid strategy should always be the first priority before engaging in the digital/social media space, it’s also smart to arm yourself with a set of tools that will help you with the tactical implementation of your plan. The 30 tools and tips in this deck have been hand-picked from personal experience, day-to-day observations, and interactions with my consulting and training clients. While on the surface, some tools may not seem to relate to your specific field or industry, rest assured they will help you with your efficiency and effectiveness in today’s digital world, where agility and “life-hacking” skills are becoming increasingly valued. I have embedded the full slide deck at the bottom of this post but you can also find it here if your organization blocks 3rd party embedded content.